Shroud of Turin: Let the discussions begin – Is the West ready for Islam? This article starts with a chapter of a book ‘Deliverance from the Cross’ by Sir Zafrulla Khan. It also includes the article on this topic from Wikipedia, the free encyclopedia and much more. If the Catholic Church believes that it is not the real thing then why hang on to it so fiercely, let the Ahmadiyya Muslim Community have it, who think that it is the real shroud of Jesus and demonstrates that he was alive when taken off the cross! If the Church thinks it is fake then give it away. The entire material relating to the subject of the Holy Shroud of Turin, as it has come to be called, reproduced in this section, is extracted from Inquest on Jesus Christ by John Reban, as translated from the German by Willi Frischauer. The Foreword is by R. H. Havercraft.A short statement of the history of the shroud, so far as is known with certainty, is set out in chapter three of that book. Since IS68, the shroud has been kept in Turin Cathedral in the chapel of the Dukes of Savoy. Every thirty-three years it is exhibited to the public. When it was exhibited in I898, some attempt was made to photograph it, but at that time photographic techniques were in their infancy. At the time of its next exhibition in I93I, steps were taken to subject it to minute photographic examination. A series of photographs were taken with the utmost care which revealed certain surprising and previously unsuspected features that enabled the students of the Shroud to go on to make certain astonish­ing deductions.The negative of one of the photographs revealed a most important feature of the Shroud, which is that a positive picture appears on the photographic negative. On the negative imprint, the bloodstains also appear as the negative of the picture, while the contours of a body appear as a positive. Scientists take this phenomenon as proof that the imprint is not the work of an artist. It is difficult enough to reproduce the positive of a picture with such delicate light shadings, but to achieve a perfect negative by artificial means is quite impossible. The biggest enlargements of the photo­graphs established that there is no trace of any dye whatsoever on the fabric.It would seem that the Shroud acted as a kind of photo­graphic plate because it had been impregnated with a solution of aloes, which reacted chemically on the spices which, as the Gospels describe, Joseph of Arimathaea and Nicodemus used on the body of Jesus for his resuscitation. As a result, the Shroud bears the image of the body which was laid on it. It also reveals that bleeding from the body took place after it was laid in the Shroud.In I959 The German Research Convention For The Shroud of Jesus petitioned Pope John XXIII to permit a small portion of the Shroud to be removed so that further tests, made possible by modern scientific discoveries and techniques, could be carried out. They wanted the bloodstains to be subjected to chemical and microscopic examination; the texture of the Shroud itself could be examined in the light of X-rays, infra-red rays, and ultra-violet rays; and an exact dating of the Shroud could be made by means of an atom dock, the carbon I4 process. The petition was rejected, not apparently by the Pope, but by the authorities in Turin. Recently, however, the present Pope, Paul VI, seems to have granted the necessary permission and it is expected that a small portion of the Shroud might become available in April I978 for further scientific investigation. ‘And he went a little further, and fell on his face, and prayed, saying, a my Father, ifit be possible, let this cup pass from me: nevertheless not as I will, but as Thou wilt’ (Matt. 26:39). We can conclude from this passage that a man prepared to die of his own free will and to offer himself for sacrificial death is unlikely to fall on his face and pray in anguish that the cup may pass from him. death which does not seem to fit into the pattern of Christian teaching. Jesus knew he would be captured, indicted, scourged, and crucified, but was certain he would be saved, rise again, and live on. For this was the message of many prophecies in the Old Testament texts which were available in his time. Knowledge of the road he had to take was heavy on his mind. Roman execution techniques had been so well perfected that there seemed little hope that the prophets’ predictions would be fulfilled. Nevertheless, he had to act as the Holy Scriptures and the will of God ordained. How much reason Jesus had to fear death emerges clearly from Mark, 14:36: ‘Abba, Father, All things are possible unto thee; take away this cup from me: nevertheless not what I will, but what Thou wilt’. In the most direct and explicit manner Jesus implored God, the Father, to spare him: ‘Take away this cup from me’. The clear, definite, and certain conclusion is: Jesus did not want to die on the cross. Today, we are in a position to add – a statement borne out by scientific proof as we shall see later – that God, the Father, to whom Jesus prayed, answered the son’s prayer and let the cup of death pass by; we can even say that he never intended to let Jesus die on the cross. These are the images of the Divine Redeemer. We might say they are the most beautiful, most moving and dearest we can imagine. They derive directly from the object surrounded by mystery which – this can safely be said – it has now been estab­lished is no product of human hands. It is the Holy Shroud at Turin. We say it is surrounded by mystery because much remains unexplained about this affair, which is certainly holy as no other is. But this much can be said – it is absolutely certain that it is not the work of man. This unequivocal statement by the highest authority of the Roman church acknowledging the authenticity of the Shroud, was published on 7/8 September 1936, in the Osservatore Romano, the official organ of the Vatican. The Shroud, a very special memento of our Lord, is kept at Turin, and the Popes have confirmed that it is identical with the Shroud in which Jesus was wrapped. More than thirty other Roman Popes have also recognised the Shroud, including Pope Pius XI, who was an archaeo­logist and scientist of world-wide repute. If God had wanted to uphold Jesus, he would have had to save him and surely not to let him die on the cross, which Moses called the accursed wood. Jesus himself was confident that he would be saved, as the Bible predicted. But one can understand that, as the climax on the cross approached – the decisive moment in the history of religion – even Jesus began to doubt and lose hope. My God, my God, why has thou forsaken me? Jesus knew that, if he died on the cross, it meant, according to the laws of Moses, that God had forsaken him. These laws entitle the Jewish people to say: God did not uphold Jesus, for he died on the cross! The history of the Jews shows throughout that, as far as they were concerned, death on the accursed cross was the end. But God did save Jesus and did not let him die on the cross; saved him as the Holy Scriptures had prophesied and as the rabbis themselves expected that God would save the Messiah. The genuine Shroud of Jesus provides positive proof. 3. Incontrovertible evidence of activity of the heart after the body had been removed from the cross and placed in the shroud. The evidence that had become available was brought to the knowledge of many people, further enquiries were initiated and many experts were questioned. Time and again, they accepted the evidence as scientifically correct and reliable. To obtain completely objective replies, it was the practice in many instances not to mention Jesus Christ at all. The aim was to get opinions based on purely scientific grounds uninfluenced by religious considerations. The result is that the fact that the heart of Jesus was beating after his body was removed from the cross has been proved beyond doubt and cannot be contradicted. I should like to sum up by emphasising once more that we have so much evidence and so many testimonials about the activity of the heart in the body of Jesus during and after his removal from the cross that it can never be disproved. You cannot imagine how confused I was when I left Cologne University. I jumped into a taxi and went to the nearest Pan­American Airways office to make a booking for New York, collected my things from the hotel, and was just in time to catch the plane. These discoveries about the Shroud strike you who are Christians differently; but I am a Jew and these things are more important to me as a Jew than as a journalist. I recovered my composure only when I was seated in the aircraft. The long flight gave me an opportunity to think the matter over quietly. Sleep was out of the question. How can I describe it? In my head my thoughts revolved around the sentence: Jesus did not die on the cross. From this followed the realisation: This means that we Jews did not murder him, could not have murdered him. Perhaps you cannot understand how I feel; within a few hours I was forced to make a personal decision. It is true that in the first instance I had taken it all in as a journalist; but who can divide himself in a matter like this? It affects Christians like you in your own way, and Jews like us in our way – but just as strongly. To us it becomes evident that, if we Jews could not have murdered Jesus, it follows that he was what he told us he was – our Messiah. This was the only reason why for almost two thousand years Jews could not believe in Jesus Christ! But this changes everything. In our blindness, we Jews tried to murder him and believed that we had done so. Because of this blindness He cast us out from the land of our Fathers. For nearly two thousand years He has let us be punished and chastised directly and indirectly. But because our guilt as it appears now, was not complete, He has opened the doors of the land of our Fathers to us again. But this was not the end of the matter for Mr. Solomon. Sometime later he went back to Cologne and had a long discussion with Professor Hirt. In the course of this discussion Professor Hirt drew M. Solomon’s attention to the fact that all four Evangelists had described the end of Jesus on the cross in the words: ‘He gave up the Ghost’, and that the Greek word for Ghost was pneuma. He proceeded: In the old world the term pneuma embraced everything that repre­sented the physical life of the human body. Blood circulation and its function, for instance, were entirely unknown. Thus, activity of the heart was not recognised as the decisive factor of life. It was breathing that represented life. In the ancient world, death was a fact when the body was without pneuma. If breathing stopped, pneuma had left the body and the man was dead. As a result of this generally accepted view, hanging, strangling and drowning were regarded as the most shameful kind of death, because it was assumed that it forced pneuma to perish in the body and prevented it from entering into another world. This was the position at the time. Revival in our sense of the word was unknown; the first to suspect that the giving up of the pneuma might not be the end of everything was the Roman doctor, Galen, who lived in the second century. Pneuma was an all-embracing term. A soldier in battle in olden days aimed at the chest of his opponent. The whole chest was regarded as the target because it was known that a stab in the chest would result in the pneuma leaving the body, resulting in death. 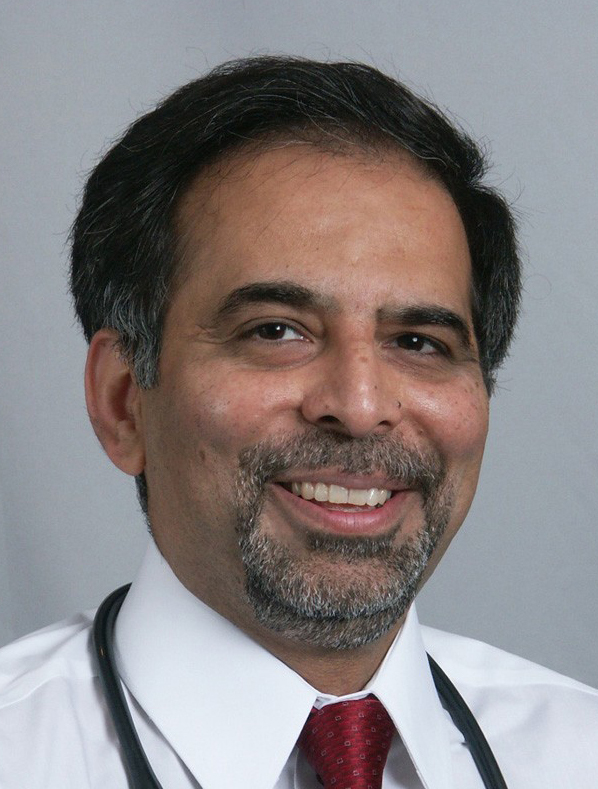 The modern medical term is Pneumothorac, which stops the function of the lung because air penetrates into the chest. This condition is dangerous but does not always result in death. In the case of Jesus it can be assumed that lung activity ended before the lance pierced the chest. The result of a stab in the chest is the end of breathing, the giving up of the pneuma, which was described as death. As things appeared in those days it meant that the man was dead. For the world of his time Jesus was dead – but he was not dead in the medical sense of our time. What we call medical death is a different death, the death of a different world. Once more we see things in the context of the contem­porary world. He who had given up the ghost was dead, and this is what was said about Jesus. But toddy, giving up the ghost is not the same as being dead; only when the heart stands still is death a medical fact. The activity of the heart and blood circulation are the criteria. Jesus was not dead, because the activity of the heart continued after the execution. The pneuma having been given up, the implication was that death had occurred. In the classical sense there was no more life in the body because breathing was part of life. But, for the purpose of the Resurrection as God willed and planned it, the continued activity of the heart had a practical purpose – and no more – because He intended it to be a resurrection of the same body, the same flesh which Jesus had before the execution. It is this fact of the complete continuation of existence after the execution which theo­logians have obscured for nearly two thousand years; they could not visualise a genuine and truly physical resurrection. But contemporary accounts show that it was exactly the same body before and after the resurrection, which was a natural factor in God’s plan, because there is no doubt at all that the whole process was God’s plan. Many centuries earlier prophecies predicted these events quite unequivocally. Jesus took them to refer to himself and predicted that he would be handed over to the executioners, would be crucified and rise again. Here Professor Hirt was asked whether he had meant that all the genuine knowledge that mankind acquires and dis­covers is the will of God, to which he replied that it was never otherwise. On one occasion in an address to a gathering of doctors Pope Pius XII touched upon the attitude of the Church to the border-line between life and death. He described the revival of patients by the artificial induction of Oxygen, as, for instance, in the case of paralysis or the presence of suffoca­tion symptoms, as morally permissible. After his address the Pope was asked at what precise moment, in the view of the Church, death occurred. Did it occur when breathing came to an end, or when the blood circulation ceased? Applying this dictum to the execution of Jesus we rely on medical science – according to the Pope, the authority in this matter. Medical science says that physical life comes to an end when circulation ceases. Thus, in the case of Jesus life did not come to an end on the cross. In all these centuries, research has produced no precise explanation of the death of Jesus on the cross, at least, none that stands up to critical examination. From a medical aspect three main points require answers, each of which must coincide with the other and fit into the whole pattern. 1. Jesus suffered no fatal injury in the course of his Passion. 2. There is an evident major contrast between the condition of Jesus, who according to the Gospel, was fully conscious to the end and the usual condition of a gravely injured, dying man. 3. The end came suddenly, virtually without any previous warning. After a careful consideration and comparison of these three points and all possible causes of death, there remains only heart failure. Heart failure is a collective description for several causes of death in which heart activity ceases instantly. Yet, heart failure must be eliminated for two reasons. First, a young and healthy man of thirty-three does not usually die of heart failure. Secondly, an unmistakable indication has come down to us making heart failure seem impossible. A man suffering from heart failure would have been unable to speak or to callout loudly: It is finished. Such an exclamation presupposed a full realisation that the end had come, the realisation and the exclamation together requiring only a few seconds. But heart failure does not allow the victim even a second. Therefore, it must have been a process which – from the moment of terror to the bowing of the head – took anything between fifteen and forty-five seconds. In the case of Jesus a brief phase in the passage of events has been overlooked, or rather not properly considered. While this is without doubt a fully established case of suffocation, one link of the chain of evidence is missing – a small link, yet one of the greatest importance. Suffocation, yes, to the expert, this is what the photographs of the Turin Shroud clearly reveal. But this slow suffocation came to a spontaneous end! A man on the cross, only a minute away from giving up the ghost, is not likely to ask for a drink in a loud and clear voice audible to all. Assuming that at this time the suffocation agony had reached such a stage, the words: I thirst; would hardly have been spoken. But they must have been spoken because they are in the Gospels. It follows that the suffocation agony. was not near the end. It was probably in the third and last stage, but this does not adequately explain how it came about that two minutes later, Jesus gave up the ghost. Contemporary accounts of the critical stage bear this out. When research on the shroud had reached the point where suffocation was established as the cause of death, the whole course of the death struggle of Jesus became clear. 1. It was suffocation, as borne out by the physical condition which the imprints on the Shroud of Turin reflect. 2. The manner of death was such that medical analysis can follow each stage from the beginning of the crucifixion to the time of Jesus saying: I thirst. The exact moment, two minutes later, when Jesus gave up the ghost is also dearly established. 3. In an ordinary case of death by suffocation as described, it would be impossible for the doomed person to speak so clearly only a minute before giving up the ghost. It follows that this was an abnormal case. Psychological considerations confirm this. Even if a man in such a condition were capable of speaking, what he would crave is not water or a drink but air! because he would be bound to realise that he would choke without it. It is the request for a drink which reflects the true state of affairs at that point of time. Drinking is only possible if the air channels are in good condition. That the air channels and breathing organs were no longer in a normal condition but in a state of cramp was one of the causes of suffocation, but not the only one. At this precise moment, there must be a link missing from the chain. The time has come to put it in its place. It is this link which caused the spontaneous end which surprised everybody. The end was brought about by one definite cause: the vinegar. Even in the case of a healthy person, the intrusion of vinegar into the air channel can produce the most serious spasms of suffocation. This is even more so when the body is tired and exhausted and all the organs directly or indirectly associated with breathing are in a state of cramp. Further­more, we are here dealing with a man who, after a slow process of suffocation, is already at the door of death which looks like being his inevitable fate. Did the man on the cross want vinegar when he exclaimed: I thirst! Certainly not. 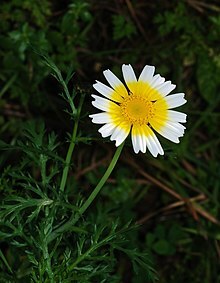 He may have expected to be given the kind of vinegar water which the Roman soldiers drank on long marches – water they usually found in springs or carried with them in tubes, and to which they added vinegar. To give the man on the cross pure vinegar was obviously an infamy perpetrated by the hangman’s assistant. We know that in antiquity there was no such thing as mercy at an execution. It was a fundamental mistake of scientific research to present this offering of vinegar as an act as harmless as if it had been vinegar water, or to interpret it even as an act of kindness. Jesus, we must remember, was as a criminal, and the doubts and wavering which beset a few people after he gave up the ghost was their reaction to the natural phenomena which accompanied it. The mystery is how these circumstances could escape the attention of the scientists for so long. It is clearly striking that three Evangelists have corresponding accounts of Jesus giving up the ghost immediately after he had been given the vinegar, one account recording the loud cry which was not understood, the other the words which proved that Jesus realised it is finished. Since, medically speaking, giving up the ghost means the end of breathing, the testimony of these three logically implies that breathing ended immediately after the administration of the vinegar. When Jesus asked for a drink, he was fully conscious and did not have the feeling that his last minute had come. In the course of the slow death struggle, he was thirsty. But, in normal circumstances, this struggle would not have ended as yet. He was given the vinegar which, immediately upon entering the air passage (speeded up by the fact that he sucked it from a sponge) cut off the air passing to and fro from the lungs, and instantly incapacitated those regions which were already affected by cramp. He had only just enough time to realise it was finished, and for a last cry which gave expression to that realisation. This was the cry which was heard by the people around him. There was only just enough air in the lungs to make the effort possible. Even a man in this desperate condition can speak for a few more seconds, – say ten to thirty – without additional intake of air. The suffering of Jesus was at an end and all who witnessed it were surprised how quickly it had come. From a medico-scientific point of view what can be said about the final phase of the crucifixion is this. In cases of death by suffocation, whatever the cause, heart activity does not necessarily end when breathing stops – which is the moment when the ghost is given up. It is true that the supply of oxygen to the blood ends, and that is bad for the heart. But, as has often been observed, the heart is capable of greatly reducing its volume of activity, and, in many similar serious cases of suffocation, heart activity is known to have continued after breathing had come to an end. Hence the attempts at revival in everyday cases of suffocation which, once breathing has stopped, make sense and have a prospect of success only if the heart is still active. The evident result of research into these events can be summed up as follows. Jesus did not die when he gave up the ghost. His heart continued to beat. Nothing occurred that brought his beating heart to a standstill; this can be proved by means of the Shroud of Jesus. The Shroud also testifies to the fact that the heart of Jesus was still active after his removal from the cross. In a legal sense the execution was not completed. To execute a man means putting his body to death. In the case of Jesus this did not happen. I. Apeheken to pneuma, which means: He gave up his ghost. 2. Exepneumen, meaning: He breathed out his last. 3. Paredoken to pneuma, again: He surrendered the ghost. voice, yielded up the ghost. my spirit; and having said thus, he gave up the ghost. 1. Matthew (27:50): Jesus again gave a loud cry, and breathed his last. 2. Mark (15:37): Then Jesus gave a loud cry and died. 3. Luke (23 :46): . . . and said, Father into they hands I commit my spirit; and with these words he died. 4. John (19:30): He bowed his head and gave up his spirit [or breathed out his life]. It will be observed that these versions obviously deviate from the ancient wording, only in the case of John does the original text run parallel with the translation, but even there it reduces the effect with the footnote, he breathed out his life. In Mark and Luke the giving up of the ghost is trans­formed into physical annihilation by the use of the word died, and in Matthew the original text was mutilated in another respect. We think it is not justified to describe a translation as God’s word if its wording and meaning do not correspond with the text of the original scripture. It is of the greatest importance that the public should get an absolutely clear idea of what is written in the Bible. Whatever the meaning of the phrase: He gave up his ghost, there is no compelling reason to assume that it implies cardiac death or syncope. According to the Apostolic Letter of Pope John XXIII to all bishops, published in the Osservatore Romano of 2 July 1960, mankind did not need the death of Jesus for its salvation. This memorable letter dealt with the importance of the blood of Jesus Christ. It shows quite clearly that mankind’s complete salvation was accomplished through the blood of Jesus Christ, in which case death was not a necessary element. But if death was essential, the blood of Jesus was of no importance. This is in accord with the basic message of the community of the Apostles in Jerusalem. At no time did the Salvation through Death take root in the old community in Palestine. On the contrary, there were bitter theological quarrels between the old community and Paul, who taught in the neighbouring countries. Modern research has brought to light that most of the invectives and curses which Paul wrote in his letters were aimed at the Palestinian community and the followers of the other Apostles. Those who did rely on Paul built on sand. Scientific discoveries and findings of the past decades as well as the unequivocal and incontrovertible revelation of the Shroud of Jesus, prove that all those who have stated in speech or writing that Jesus died on the cross, have spoken or written an untruth, albeit in ignorance of the true facts. Those who henceforth assert in speech or writing that Jesus died on the cross will speak and write that untruth. They will be circulating deliberate lies because they must now be aware of the true facts. The Shroud of Turin: recent photo of the face, positive left, negative right. Negative has been contrast enhanced. The Shroud of Turin (or Turin Shroud) is a linen cloth bearing the image of a man who appears to have suffered physical trauma in a manner consistent with crucifixion. It is kept in the royal chapel of the Cathedral of Saint John the Baptist in Turin, northern Italy. The origins of the shroud and its image are the subject of intense debate among scientists, theologians, historians and researchers. Some contend that the shroud is the cloth placed on the body of Jesus Christ at the time of his burial, and that the face image is the Holy Face of Jesus. Others contend that the artifact postdates the Crucifixion of Jesus by more than a millennium. Both sides of the argument use science and historical documents to make their case. The image on the shroud is much clearer in black-and-white negative than in its natural sepia color. The striking negative image was first observed on the evening of May 28, 1898, on the reverse photographic plate of amateur photographer Secondo Pia, who was allowed to photograph it while it was being exhibited in the Turin Cathedral. The Catholic Church has neither formally endorsed nor rejected the shroud, but in 1958 Pope Pius XII approved of the image in association with the Roman Catholic devotion to the Holy Face of Jesus. Most probably, the Shroud of Turin is the single, most studied artifact in human history. In 1978 a detailed examination was carried out by a team of American scientists called STURP. It found no reliable evidences of forgery. STURP called the question of how the image was formed “a mystery”. In 1988 a radiocarbon dating test was performed on small samples of the shroud, concluding that they date from the Middle Ages, between 1260 and 1390. Controversy has arisen over the reliability of the test. Secondo Pia‘s 1898 negative of the image on the Shroud of Turin has an appearance suggesting a positive image. It is used as part of the devotion to Holy Face of Jesus. The shroud is rectangular, measuring approximately 4.4 × 1.1 m (14.3 × 3.7 ft). The cloth is woven in a three-to-one herringbone twill composed of flax fibrils. Its most distinctive characteristic is the faint, yellowish image of a front and back view of a naked man with his hands folded across his groin. The two views are aligned along the midplane of the body and point in opposite directions. The front and back views of the head nearly meet at the middle of the cloth. scores of linear wounds on the torso and legs. Proponents claim that the wounds are consistent with the distinctive dumbbell wounds of a Roman flagrum. The shroud includes images that are not easily distinguishable by the naked eye, and were first observed after the advent of photography. In May 1898 amateur Italian photographer Secondo Pia was allowed to photograph the shroud and he took the first photograph of the shroud on the evening of May 28, 1898. Pia was startled by the visible image of the negative plate in his darkroom. Negatives of the image give the appearance of a positive image, which implies that the shroud image is itself effectively a negative of some kind. Pia was at first accused of doctoring his photographs, but was vindicated in 1931 when a professional photographer, Giuseppe Enrie, also photographed the shroud and his findings supported Pia’s. The image of the “Man of the Shroud” has a beard, moustache, and shoulder-length hair parted in the middle. He is muscular and tall (various experts have measured him as from 1.75 m, or roughly 5 ft 9 in, to 1.88 m, or 6 ft 2 in). Fourteen large triangular patches and eight smaller ones were sewn onto the cloth by Poor Clare nuns to repair the damage from a fire in 1532 in the chapel in Chambery, France. Some burn holes and scorched areas down both sides of the linen are present, due to contact with molten silver during the fire that burned through it in places while it was folded. Archaeologist William Meacham states that of all religious relics, the history of the Shroud of Turin has generated the greatest controversy. According to author Brian Haughton it is difficult to imagine a more controversial historical artifact, and that much of its history is obscure, with no historical record until the 16th century. Although prior historical references exist to some pieces of cloth with images, it is uncertain if these are the same as the shroud that is now in the Cathedral in Turin. The Catholic Encyclopedia echoes the same sentiment: “A certain difficulty was caused by the existence elsewhere of other Shrouds similarly impressed with the figure of Jesus Christ.” However, the Catholic encyclopedia, as well as some other authors suggest that the recorded history traces back to the 14th century, but an origin date in the 15th century has also been suggested. The historical records for the shroud can be separated into three time periods: prior to the 14th century; from the 14th to the 16th century; and thereafter. Prior to the 14th century there are some congruent references like Pray Codex. The period from the 14th to the 16th century is subject to debate and controversy among historians. The history from the 16th century to the present is well understood (and uneventful except for two chapel fires), since the shroud has been housed in Turin Cathedral since then. As of the 17th century the shroud has been displayed (e.g. in the chapel built for that purpose by Guarino Guarini) and in the 19th century it was first photographed during a public exhibition. There are no definite historical records concerning the shroud prior to the 14th century. Although there are numerous reports of Jesus’ burial shroud, or an image of his head, of unknown origin, being venerated in various locations before the fourteenth century, there is no historical evidence that these refer to the shroud currently at Turin Cathedral. Historical records indicate that a shroud bearing an image of a crucified man existed in the small town of Lirey, France around the years 1353 to 1357. However, the correspondence of this shroud with the shroud in Turin, and its very origin has been debated by scholars and lay authors, with claims of forgery attributed to artists born a century apart. Some contend that the Lirey shroud was the work of a confessed forger and murderer. Professor Larissa Tracy, of Virginia also argues that the shroud in Turin is a forgery, but that it was forged by Leonardo da Vinci, who was born in 1452. Professor Nicholas Allen of South Africa on the other hand believes that the image was made photographically and not by an artist. Professor John Jackson of Colorado argues that the shroud in Turin dates back to the first century AD. In his painting of the shroud in a Descent from the cross scene, Giulio Clovio made one slight error and showed the right hand crossed over the left, c. 1540. The history of the shroud from the middle of 16th century is well recorded. 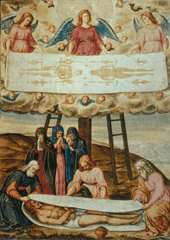 The existence of a miniature by Giulio Clovio, which gives a good representation of what was seen upon the shroud about the year 1540, confirms that the shroud housed in Turin today is the same one as in the middle of the 16th century. In 1532, the shroud suffered damage from a fire in the chapel where it was stored. A drop of molten silver from the reliquary produced a symmetrically placed mark through the layers of the folded cloth. Poor Clare Nuns attempted to repair this damage with patches. In 1578 the House of Savoy took the shroud to Turin and it has remained at Turin Cathedral ever since. A fire, possibly caused by arson, threatened the shroud on 11 April 1997, but a fireman saved it from significant damage. In 2002, the Holy See had the shroud restored. The cloth backing and thirty patches were removed, making it possible to photograph and scan the reverse side of the cloth, which had been hidden from view. A ghostly part-image of the body was found on the back of the shroud in 2004. The most recent public exhibition of the Shroud was in 2000 for the Great Jubilee. The next exhibition is scheduled on April 10—May 23, 2010. Religious beliefs about the burial cloths of Jesus have existed for centuries. The Gospels of Matthew[27:59-60], Mark[15:46] and Luke[23:53] state that Joseph of Arimathea wrapped the body of Jesus in a piece of linen cloth and placed it in a new tomb. The Gospel of John[20:6-7] states that Apostle Peter found multiple pieces of burial cloth after the tomb was found open, strips of linen cloth for the body and a separate cloth for the head. Although pieces of burial cloths of Jesus are claimed by at least four churches in France and three in Italy none has gathered as much religious following as the Shroud of Turin. The religious beliefs and practices associated with the shroud predate historical and scientific discussions and have continued in the 21st century, although the Catholic Church has never claimed its authenticity. An example is the Holy Face Medal bearing the image from the shroud, worn by some Catholics. 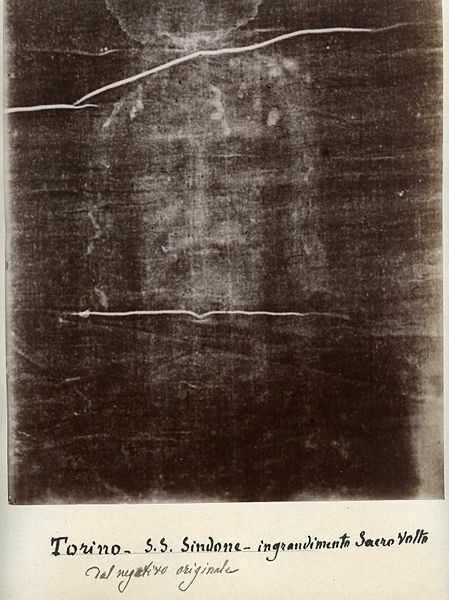 Although the shroud image is currently associated with Catholic devotions to the Holy Face of Jesus, the devotions themselves predate Secondo Pia‘s 1898 photograph. Such devotions had been started in 1844 by the Carmelite nun Marie of St Peter (based on “pre-crucifixion” images associated with the Veil of Veronica) and promoted by Leo Dupont, also called the Apostle of the Holy Face. In 1851 Leo Dupont formed the “Archconfraternity of the Holy Face” in Tours, France, well before Secondo Pia took the photograph of the shroud. 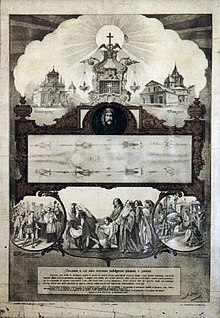 A poster advertising the 1898 exhibition of the shroud in Turin. Secondo Pia‘s photograph was taken a few weeks too late to be included in the poster. The image on the poster includes a painted face, not obtained from Pia’s photograph. The religious concept of “miraculous image” has been applied to the Shroud of Turin, as it has been applied to other religious artifacts such as the image of the Virgin Mary on the cloak in the Basilica of Our Lady of Guadalupe on Tepeyac hill in Mexico. Without debating scientific issues, some believers state as a matter of faith that empirical analysis and scientific methods will perhaps never advance to a level sufficient for understanding the divine methods used for image formation on the shroud, since the body around whom the shroud was wrapped was not merely human, but divine, and believe that the image on the shroud was miraculously produced at the moment of Resurrection. Quoting Pope Paul VI‘s statement that the shroud is “the wonderful document of His Passion, Death and Resurrection, written for us in letters of blood” author Antonio Cassanelli argues that the shroud is a deliberate divine record of the five stages of the Passion of Christ. The Vatican newspaper Osservatore Romano covered the story of Secondo Pia‘s photograph of May 28, 1898 in its June 15, 1898 edition, but it did so with no comment and thereafter Church officials generally refrained from officially commenting on the photograph for almost half a century. The first official association between the image on the Shroud and the Catholic Church was made in 1940 based on the formal request by Sister Maria Pierina De Micheli to the curia in Milan to obtain authorization to produce a medal with the image. The authorization was granted and the first medal with the image was offered to Pope Pius XII who approved the medal. The image was then used on what became known as the Holy Face Medal worn by many Catholics, initially as a means of protection during the Second World War. In 1958 Pope Pius XII approved of the image in association with the devotion to the Holy Face of Jesus, and declared its feast to be celebrated every year the day before Ash Wednesday. Following the approval by Pope Pius XII, Catholic devotions to the Holy Face of Jesus have been almost exclusively associated with the image on the shroud. In 1983 the Shroud was given to the Holy See by the House of Savoy. However, as with all relics of this kind, the Roman Catholic Church made no pronouncements claiming whether it is Jesus’ burial shroud, or if it is a forgery. As with other approved Catholic devotions, the matter has been left to the personal decision of the faithful, as long as the Church does not issue a future notification to the contrary. In the Church’s view, whether the cloth is authentic or not has no bearing whatsoever on the validity of what Jesus taught nor on the saving power of his death and resurrection. Pope Benedict XVI has not publicly commented on the Shroud’s authenticity, but has taken steps that indirectly affect the Shroud. In June 2008 he approved the public display of the Shroud in the Spring of 2010 and stated that he would like to go to Turin to see it along with other pilgrims. In April 2009 Pope Benedict XVI advanced the beatification process of Sister Maria Pierina De Micheli who coined the Holy Face Medal, based on Secondo Pia’s photograph of the Shroud, by formally recognizing a miracle attributed to her. The term sindonology (from the Greek σινδών—sindon, the word used in the Gospel of Mark[15:46] to describe the type of the burial cloth of Jesus) is used to refer to the formal study of the Shroud. Secondo Pia‘s 1898 photographs of the shroud allowed the scientific community to begin to study it. A variety of scientific theories regarding the shroud have since been proposed, based on disciplines ranging from chemistry to biology and medical forensics to optical image analysis. Very few scientists (e.g. STURP and the Radiocarbon dating teams) have had direct access to the shroud or very small samples from it, and most theories have been proposed “long distance” by the analysis of images, or via secondary sources. The scientific approaches to the study of the Shroud fall into three groups: material analysis (both chemical and historical), biology and medical forensics and image analysis. The initial steps towards the scientific study of the shroud were taken soon after the first set of black and whites photographs became available early in the 20th century. In 1902 Yves Delage, a French professor of comparative anatomy published the first study on the subject. Delage declared the image anatomical flawlessness and argued that the features of rigor mortis, wounds, and blood flows were evidence that the image was formed by direct or indirect contact with a corpse. William Meacham mentions several other medical studies performed between 1936 to 1981 which have agreed with Delage. However, these were all indirect studies without access to the shroud itself. The first direct examination of the shroud by a scientific team was undertaken in 1969-1973 in order to advise on the preservation of the shroud and for the determination of specific testing methods. This led to the appointment of an 11-member Turin Commission to advise on the preservation of the relic and on specific testing which might be performed. Five of the commission members were scientists, and preliminary studies of samples of the fabric were conducted in 1973. Phase contrast microscopic view of image-bearing fiber from the Shroud of Turin. Carbohydrate layer is visible along top edge. The lower-right edge shows that coating is missing. The coating can be scraped off or removed with adhesive or diimide. After years of discussion, the Holy See permitted radiocarbon dating on portions of a swatch taken from a corner of the shroud. Independent tests in 1988 at the University of Oxford, the University of Arizona, and the Swiss Federal Institute of Technology concluded that the shroud material dated to 1260-1390 AD, with 95% confidence. This 13th to 14th century dating matches the first appearance of the shroud in church history, and is somewhat later than art historian W.S.A. Dale’s estimate of an 11th century date based on art-historical grounds. Once generally accepted by the scientific community by those who consider the shroud to be inauthentic, and by some members of the Catholic Church, these results have since been questioned in peer-reviewed journals by Raymond Rogers in Thermochimica Acta and by M.Sue Benford and Joseph G. Marino in Chemistry Today. Criticisms have been raised about aspects of the study as doubts were raised regarding the original nature of the sample that was taken for testing, not the quality of the radiocarbon testing itself.. In 1970s a special eleven-member Turin Commission conducted several tests. Conventional and electron microscopic examination of the Shroud at that time revealed an absence of heterogeneous coloring material or pigment. In 1979, Walter McCrone, upon analyzing the samples he was given by STURP, concluded that the image is actually made up of billions of submicrometre pigment particles. The only fibrils that had been made available for testing of the stains were those that remained affixed to custom-designed adhesive tape applied to thirty-two different sections of the image. John Heller and lan Adler examined the same samples and agreed with McCrone’s result that the cloth contains iron oxide. However, they concluded, the exceptional purity of the chemical and comparisons with other ancient textiles showed that, while retting flax absorbs iron selectively, the iron itself was not the source of the image on the shroud. Other microscopic analysis of the fibers seems to indicate that the image is strictly limited to the carbohydrate layer, with no additional layer of pigment visible. In 2000, fragments of a burial shroud from the first century were discovered in a tomb near Jerusalem, believed to have belonged to a Jewish high priest or member of the aristocracy. The shroud was composed of a simple two-way weave, unlike the complex weave of the Turin Shroud. Based on this discovery, these researchers stated that the Turin Shroud did not originate from Jesus-era Jerusalem. A Roman loom, c. 2nd century CE. In 1999 Mark Guscin investigated the relationship between the shroud and the Sudarium of Oviedo, claimed as the cloth that covered the head of Jesus in the [[Gospel of John][20:6-7] when the empty tomb was discovered. The Sudarium is also reported to have type AB blood stains. Guscin concluded that the two cloths covered the same head at two distinct, but close moments of time. Avinoam Danin (see below) concurred with this analysis, adding that the pollen grains in the Sudarium match those of the shroud. Skeptics criticize the polarized image overlay technique of Guscin and suggest that pollen from Jerusalem could have followed any number of paths to find its way to the sudarium. In 2002, Aldo Guerreschi and Michele Salcito argued that that many of these marks on the fabric of the shroud stem from a much earlier time because the symmetries correspond more to the folding that would have been necessary to store the cloth in a clay jar (like cloth samples at Qumran) than to that necessary to store it in the reliquary that housed it in 1532. Joseph Kohlbeck from the Hercules Aerospace Center in Utah and Richard Levi-Setti of the Enrico Fermi Institute examined some dirt particles from the Shroud surface. The dirt was found to be travertine aragonite limestone. Using a high-resolution microprobe, Levi-Setti and Kolbeck compared the spectra of samples taken from the Shroud with samples of limestone from ancient Jerusalem tombs. The chemical signatures of the Shroud samples and the tomb limestone were found identical except for minute fragments of cellulose linen fiber that could not be separated from the Shroud samples. There are several reddish stains on the shroud suggesting blood, but is uncertain whether these stains were produced at the same time as the image, or afterwards. McCrone (see painting hypothesis) identified these as containing iron oxide, theorizing that its presence was likely due to simple pigment materials used in medieval times. Other researchers, including Alan Adler identified the reddish stains as type AB blood and interpreted the iron oxide as a natural residue of hemoglobin. Blood type AB has been assumed to have relatively recent origin, perhaps as early as AD 700, but this notion is controversial due to principles of blood inheritance and co-dominance. Joe Nickell argues that results similar to Heller and Adler’s could be obtained from tempera paint. Skeptics also cite other forensic blood tests whose results dispute the authenticity of the Shroud and that the blood could belong to a person handling the shroud, that the apparent blood flows on the shroud are unrealistically neat. In 1997 Avinoam Danin, a botanist at the Hebrew University of Jerusalem, reported that he had identified the type of Chrysanthemum coronarium, Cistus creticus and Zygophyllum whose pressed image on the shroud was first noticed by Alan Whanger in 1985 on the photographs of the shroud taken in 1931. He reported that the outlines of the flowering plants would point to March or April and the environs of Jerusalem. In a separate report in 1978 Danin and Uri Baruch reported on the pollen grains on the cloth samples, stating that they were appropriate to the spring in Israel. Max Frei, a Swiss police criminologist who initially obtained pollen from the shroud during the STURP investigation stated that of the 58 different types of pollens found, 45 were from the Jerusalem area, while 6 were from the eastern Middle East, with one pollen species growing exclusively in Constantinople, and two found in Edessa, Turkey. Mark Antonacci argues that the pollen evidence and flower images are inherently intervowen and strengthen each other. Skeptics argue that the flower images are too faint for Danin’s determination to be definite, that an independent review of the pollen strands showed that one strand out of the 26 provided contained significantly more pollen than the others, perhaps pointing to deliberate contamination and that Frei had overstated evidence in a separate matter that did not involve the shroud. NASA researchers Jackson, Jumper, and Stephenson report detecting the impressions of coins placed on both eyes after a digital study in 1978. The two-lepton coin on the right eyelid was presumably coined under Pilate in 29—30, while the one-lepton coin on the left eyebrow was minted in 29. Greek and Latin letters were discovered written near the face (Piero Ugolotti, 1979). These were further studied by André Marion, professor at the École supérieure d’optique and his student Anne Laure Courage, graduate engineer of the École supérieure d’optique, in the Institut d’optique théorique et appliquée in Orsay (1997). Subsequently, through computerized analysis and microdensitometer, other writings were found, among them INNECEM (a shortened form of Latin “in necem ibis”—”you will go to death”), NNAZAPE(N)NUS (Nazarene), IHSOY (Jesus) and IC (Iesus Chrestus). The uncertain letters IBE(R?) have been conjectured as “Tiberius“. Image analysis by scientists at the Jet Propulsion Laboratory found that rather than being like a photographic negative, the image unexpectedly has the property of decoding into a 3-D image of the man when the darker parts of the image are interpreted to be those features of the man that were closest to the shroud and the lighter areas of the image those features that were farthest. This is not a property that occurs in photography, and researchers could not replicate the effect when they attempted to transfer similar images using techniques of block print, engravings, a hot statue, and bas-relief. In 2004, in an article in the Journal of Optics G. Fanti, R. Maggiolo reported finding a faint second face on the backside of the cloth, after the 2002 restoration. Many hypotheses have been formulated and tested to explain the image on the Shroud. 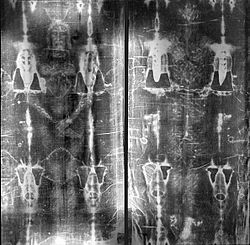 To date, despite numerous and often media-related claims, it can be said that “the body image of the Turin Shroud has not yet been explained by traditional science; so a great interest in a possible mechanism of image formation still exists.”. 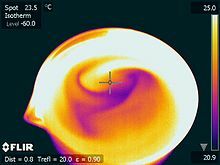 A thermographic image of a glass of water. The technique used for producing the image is, according to W. McCrone, already described in a book about medieval painting published in 1847 by Charles Lock Eastlake (“Methods and Materials of Painting of the Great Schools and Masters”). Eastlake describes in the chapter “Practice of Painting Generally During the XIVth Century” a special technique of painting on linen using tempera paint, which produces images with unusual transparent features—which McCrone compares to the image on the shroud. This hypothesis was declared to be unsound as the X-ray fluorescence examination, as well as infrared thermography, did not point out any pigment. It was also found that 25 different solvents, among them water, do not reduce or sponge out the image. The non-paint origin has been further claimed by Fourier transform of the image: in the common paintings one points out a directionality that is on the contrary absent in the Turin Shroud. According to the art historian Nicolas Allen the image on the shroud was formed by a photographic technique in the 13th century. Allen maintains that techniques already available before the 14th century, as e.g. described in the Book of Optics which was at just this time translated from Arabic into Latin, were sufficient to produce primitive photographs and that people familiar with these techniques would have been able to produce an image as found on the shroud. To demonstrate this, he has successfully produced photographic images similar to the shroud using only techniques and materials available at the time the shroud was made. He described his results in his PhD Thesis, in papers published in several science journals, and in a book. However a double photographic exposure, needed in that case, should have considered the distances and in such case there would be areas of photographic superimposition with different lights and shades. The distances on Shroud instead correspond to the body position. Scientists Emily Craig and Randall Bresee have attempted to recreate the likenesses of the shroud through the dust-transfer technique which could have been done by medieval arts. They first did a carbon-dust drawing of a Jesus-like face (using collagen dust) on a newsprint made from wood pulp (which is similar, but not identical to, 13th and 14th century paper). They next placed the drawing on a table and covered it with a piece of linen. They then pressed the linen against the newsprint by firmly rubbing with the flat side of a wooden spoon. By doing this they managed to create a reddish brown image with a life-like positive likeness of a person, a three dimensional image and no sign of brush strokes. Another hypothesis suggests that the Shroud may have been formed using a bas-relief sculpture. 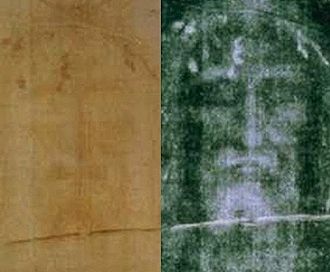 Researcher Jacques di Costanzo, noting that the Shroud image seems to have a three-dimensional quality, suggested that perhaps the image was formed using an actual three-dimensional object, like a sculpture. While wrapping a cloth around a life-sized statue would result in a distorted image, placing a cloth over a bas-relief would result in an image like the one seen on the shroud. To demonstrate the plausibility of his hypothesis, Costanzo constructed a bas-relief of a Jesus-like face and draped wet linen over the bas-relief. After the linen dried, he dabbed it with a mixture of ferric oxide and gelatine. The result was an image similar to that of the Shroud. The imprinted image turned out to be wash-resistant, impervious to temperatures of 250 °C (482 °F) and was undamaged by exposure to a range of harsh chemicals, including bisulphite which, without the help of the gelatine, would normally have degraded ferric oxide to the compound ferrous oxide. Similar results have been obtained by author Joe Nickell. Instead of painting, the bas-relief could also be heated and used to burn an image into the cloth. However, after comparing the histograms of 256 different grey levels, it was found that the image obtained with a bas-relief has grey values included between 60 and 256 levels, but it is much contrasted with wide areas of white saturation (levels included between 245 and 256) and lacks of intermediate grey levels (levels included between 160 and 200). The face image on the Shroud instead has grey tonalities that vary in the same values field (between 60 and 256), but the white saturation is much less marked and the histogram is practically flat in correspondence of the intermediate grey levels (levels included between 160 and 200). The Maillard reaction is a form of non-enzymatic browning involving an amino acid and a reducing sugar. The cellulose fibers of the shroud are coated with a thin carbohydrate layer of starch fractions, various sugars, and other impurities. In a paper entitled “The Shroud of Turin: an amino-carbonyl reaction may explain the image formation,” R.N. Rogers and A. Arnoldi propose that amines from a recently deceased human body may have undergone Maillard reactions with this carbohydrate layer within a reasonable period of time, before liquid decomposition products stained or damaged the cloth. The gases produced by a dead body are extremely reactive chemically and within a few hours, in an environment such as a tomb, a body starts to produce heavier amines in its tissues such as putrescine and cadaverine. However the potential source for amines required for the reaction is a decomposing body, while no signs of decomposition have been found on the Shroud. Since 1930 several researchers (J. Jackson, G. Fanti, T. Trenn, T. Phillips, J.-B. Rinaudo and others) endorsed the flash-like irradiation hypothesis bound to what American chemist Giles Carter called the Resurrection Event. It was suggested that the relatively high definition of the image details can be obtained through the energy source (specifically, protonic) acting from inside. The Russian researcher Alexander Belyakov proposed an intense, but short flashlight source, which lasted some hundredths of second. The Canadian researcher Thaddeus J. Trenn theorizes that the image was formed by bombardment of pions and muons, released after the so-called weak dematerialization. Some other authors suggest the X-radiation or a burst of directional ultraviolet radiation may have played a role in the formation of the Shroud image. From the image characteristics, several researchers suppose that the radiant source was prevalently vertical. During restoration in 2002, the back of the cloth was photographed and scanned for the first time. An article on this subject by Giulio Fanti of the University of Padua and others envisages the electrostatic corona discharge as the probable mechanism to produce the images of the body in the Shroud. Congruent with that mechanism, they also describe an image on the reverse side of the fabric, much fainter than that on the front view of the body, consisting primarily of the face and perhaps hands. Like the front picture, it is entirely superficial, with coloration limited to the carbohydrate layer. The images correspond to, and are in registration with, those on the other side of the cloth. No image is detectable in the reverse side of the dorsal view of the body. Supporters of the Maillard reaction theory point out that the gases would have been less likely to penetrate the entire cloth on the dorsal side, since the body would have been laid on a stone shelf. On April 6, 2009, the London newspaper The Times reported that Dr. Barbara Frale, an official Vatican researcher, had uncovered evidence that the Shroud had been kept and venerated by the Templars since the 1204 sack of Constantinople. According to the account of one neophyte member of the order, veneration of the Shroud appeared to be part of the initiation ritual. The article also implies that this ceremony may be the source of the ‘worship of a bearded figure’ that the Templars were accused of at their 14th century trial and suppression. On October 5, 2009 Luigi Garlaschelli, professor of organic chemistry at the University of Pavia, announced that he had made a full size reproduction of the Shroud of Turin using only medieval technologies. Garlaschelli placed a linen sheet over a volunteer and then rubbed it with an acidic pigment. The shroud was then aged in an oven before being washed to remove the pigment. He then added blood stains, scorches and water stains to replicate the original. The image on the reproduction, non peer-reviewed, would closely match that of the Turin Shroud with differences explained as the result of natural fading over the centuries. But according to noted sindonologist Giulio Fanti, professor of mechanical and thermic measurements at the Padua University, “the image in discussion does not match the main fundamental properties of the Shroud image, in particular at thread and fiber level but also at macroscopic level”. In November 2009 Dr. Barbara Frale announced that she had “managed to read the burial certificate of Jesus the Nazarene, or Jesus of Nazareth.” imprinted in fragments of Greek, Hebrew and Latin writing, together with the image of a crucified man on the cloth. She asserted that the inscription provided an “historical date consistent with the Gospels account” and that the letters, not obvious to the human eyes, were first detected during an examination of the shroud in 1978, with others since coming to light. Like the image of the man himself Frale reports that the letters are in reverse and only become intelligible in negative photographs. Frale further asserts that under contemporary Jewish burial practices, within a Roman colony such as Palestine, a body buried after a death sentence could only be returned to the family after a year in a common grave (though the gospels report that Jesus was buried in a tomb provided by Joseph of Arimathea), therefore a death certificate was glued to the burial shroud, usually stuck to the face, to identify it for later retrieval. “In the year 16 of the reign of the Emperor Tiberius Jesus the Nazarene, taken down in the early evening after having been condemned to death by a Roman judge because he was found guilty by a Hebrew authority, is hereby sent for burial with the obligation of being consigned to his family only after one full year”. Frale further argues that the use of three languages was in line with the multi-lingual practices of Greek-speaking Jews in a Roman colony. In 2010, three professors of statistics wrote in a scientific paper that the statistical analysis of the raw dates obtained from the three laboratories suggests “the presence of an important contamination in the 1988 TS samples”. ^ William Meacham, The Authentication of the Turin Shroud: An Issue in Archaeological Epistemology, Current Anthropology, Volume 24, No 3, June 1983. ^ « The Shroud of Turin is the single, most studied artifact in human history » statement considered as « widely accepted » in Lloyd A Currie, « The Remarkable Metrological History of Radiocarbon Dating [II] », J. Res. Natl. Inst. Stand. Technol. 109, 2004, p. 200 Article. ^ a b Damon, P. E.; D. J. Donahue, B. H. Gore, A. L. Hatheway, A. J. T. Jull, T. W. Linick, P. J. Sercel, L. J. Toolin, C. R. Bronk, E. T. Hall, R. E. M. Hedges, R. Housley, I. A. Law, C. Perry, G. Bonani, S. Trumbore, W. Woelfli, J. C. Ambers, S. G. E. Bowman, M. N. Leese, M. S. Tite (1989-02). “Radiocarbon dating of the Shroud of Turin”. Nature 337 (6208): 611–615. doi:10.1038/337611a0. http://www.nature.com/nature/journal/v337/n6208/abs/337611a0.html. Retrieved 2007-11-18. ^ Ashall, Frank. Remarkable Discoveries!. Cambridge University Press. p. 36. ISBN 0521589533. ^ Lorenzi, Rossella. “Shroud of Turin’s Authenticity Probed Anew”. Discovery Channel. Discovery Communications. http://dsc.discovery.com/news/2008/03/21/shroud-turin.html. Retrieved 2008-03-30. ^ “How Tall is the Man of the Shroud of Turin”. Shroudofturin4journalists.com. http://www.shroudofturin4journalists.com/Details/howtall.htm. Retrieved 2009-04-12. ^ a b c “The Holy Shroud (of Turin)”. Catholic Encyclopedia. New York: Robert Appleton Company. 1913. http://en.wikisource.org/wiki/Catholic_Encyclopedia_(1913)/The_Holy_Shroud_(of_Turin). ^ “Was Turin Shroud faked by Leonardo da Vinci?”. telegraph. http://www.telegraph.co.uk/news/newstopics/religion/5706640/Turin-Shroud-is-face-of-Leonardo-da-Vinci.html. Retrieved 2009-07-03. ^ Delage, Yves. 1902. Le Linceul de Turin. Revue Scientifique 22:683-87. ^ Vignon, Paul. 1937. The problem of the Holy Shroud. Scientific American 156:162-64. ^ Moedder, Hermann. 1949. Die Todesurache dei der Kreuzigung. Stimmen der Zeit 144:50-59. ^ W.S.A. Dale, “The Shroud of Turin: Relic or Icon?” Nuclear Instruments and Methods in Physics Research B29 (1987) 187-192 http://dx.doi.org/10.1016/0168-583X(87)90233-3. This paper is significant in that it was presented to the international radiocarbon community shortly before radiocarbon dating was performed on the shroud. ^ Dickman, S. – Shroud a good forgery – Nature, Vol. 335, Oct. 20, 1988, p. 663. ^ Salvatore Tropea. E a settembre il papa ordinò “si pubblichi…”. La Repubblica, October 14, 1988, page 9. ^ Rogers R.N. – Studies on the radiocarbon sample from the Shroud of Turin – Thermochimica Acta, Vol. 425, 2005, pp. 189-194. ^ Rogers, R.N. (2001). Supportive comments on the Benford-Marino ’16 thcentury repairs’ hypothesis. British Society for the Turin Shroud, Shroud Newsletter 54, 28-33. ^ Benford, M.S., and Marino, J.G. Historical Support of a 16th Century Restoration in the Shroud C-14 Sample Area. ^ Benford, M.S., and Marino, J.G. Textile Evidence Supports Skewed Radiocarbon Date of Shroud of Turin. ^ Busson, P. – Letter – Sampling error? – Nature, Vol. 352, July 18, 1991, p. 187. ^ McCrone, W. C., Skirius, C., The Microscope, 28, 1980, pp 1-13; McCrone, W. C., The Microscope, 29, 1981, p. 19-38. Microscope 1980, 28, 105, 115; 1981, 29, 19; Wiener Berichte uber Naturwissenschaft in der Kunst 1987/1988, 4/5, 50 and Acc. Chem. Res. 1990, 23, 77–83. ^ “DNA of Jesus-era shrouded man in Jerusalem reveals earliest case of leprosy”. Physorg.com. 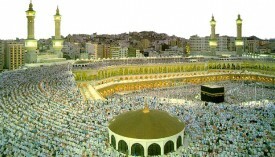 December 16, 2009. http://www.physorg.com/news180165623.html. Retrieved December 16, 2009. ^ Bell, Bethany (December 16, 2009). “‘Jesus-era’ burial shroud found”. BBC News. http://news.bbc.co.uk/2/hi/middle_east/8415377.stm. Retrieved December 16, 2009. ^ “Shroud of Turin Not Jesus’, Tomb Discovery Suggests”. National Geographic Daily News. 12-19-2009. http://news.nationalgeographic.com/news/2009/12/091216-shroud-of-turin-jesus-jerusalem-leprosy.html. Retrieved 03-22-2010. ^ a b c “shroud of Turin”. Skepdic.com. 2000-08-23. http://www.skepdic.com/shroud.html. Retrieved 2009-04-12. ^ “Were particles of limestone dirt found on the Shroud of Turin?”. Shroud Story. http://www.shroudstory.com/faq/Shroud-Turin-Travertine.htm. Retrieved 2010-02-27. ^ “Peter D’Adamo: ”Blood groups and the history of peoples.” In: ”Complete Blood Type Encyclopedia.””. Dadamo.com. 1999-01-15. http://www.dadamo.com/knowbase/theory/anthro.htm. Retrieved 2009-04-12. ^ Rogers, Raymond. “Frequently Asked Questions (FAQs) by Raymond N. Rogers”. http://www.shroud.com/pdfs/rogers5faqs.pdf. Retrieved 2009-06-15. ^ Baden, Michael. 1980. Quoted in Reginald W. Rhein, Jr., The Shroud of Turin: Medical examiners disagree. Medical World News, December 22, p. 50. ^ Jackson, John P., Eric J. Jumper, Bill Mottern, and Kenneth E. Stevenson. 1977. “The three-dimensional image of Jesus’ burial cloth.” Proceedings of the 1977 U.S. Conference of Research on the Shroud of Turin. Edit by Kenneth Stevenson, pp. 74-94. Bronx: Holy Shroud Guild. ^ Mark Guscin. “The “Inscriptions” on the Shroud” (PDF). http://www.shroud.com/pdfs/guscin2.pdf. Retrieved 2010-03-27. ^ a b Giulio Fanti, Emanuela Marinelli. “Results of a Probabilistic Model Applied to the Research Carried Out on the Turin Shroud”. Shroud.com. http://www.shroud.com/fanti3en.pdf. Retrieved 2010-03-26. ^ Allen, Nicholas P. L.(1993) The methods and techniques employed in the manufacture of the Shroud of Turin. Unpublished DPhil thesis, University of Durban-Westville. ^ Ingham, Richard (2005-06-21). “Turin Shroud Confirmed as Fake”. Physorg.com (Agence France-Presse). http://www.physorg.com/news4652.html. Retrieved 2008-02-17. ^ “Features of the Center”. Shroud Center of Southern California. http://www.shroudcentersocal.com/. Retrieved 2010-03-27. ^ a b “X-File on the Shroud”. British Society For The Turin Shroud – Issue no. 49, June 1999. http://www.shroud.com/n49part3.pdf. Retrieved 2010-03-26. ^ Marco Riani, Anthony C. Atkinson, Fabio Crosilla, and Giulio Fanti, “A Robust Statistical Analysis of the 1988 Turin Shroud Radiocarbon Dating Results”, Robust Statistical Analysis of the 1988 Turin Shroud Radiocarbon Dating Results. International Workshop on the Scientific Approach to the Acheiropoietos Images, ENEA Resarch Center of Frascati (Italy), 4-5–6 May 2010. McCrone, Walter : Judgment Day for The Turin Shroud. 1996 Chicago: Microscope Publications. Shroud of Turin, sacred relic or religious hoax? McCrone Research Institute presentation of its findings Assertion that the shroud is a painting. News on the Shroud of Turin: Purpura-dye as a light sensitive layer? German, with an English summary. We have debated hard and long various aspects of Christianity. We have also enjoyed the novel or the movie Da Vinci code. Let me now lay down two fool proof methods to assess this issue. Do not under estimate the utility of this post, just because it is being launched without much fan fare. If the DNA from two such divergent sources is of the same person then there is no choice but to believe that DNA is from a single source and it cannot be denied that Jesus was wrapped in the shroud while he lived and then he migrated and lived in Kashmir and was eventually buried there is Srinagar, Kashmir. The shroud first emerged historically in 1354, when it is recorded in the hands of a famed knight, Geoffroi de Charnay, seigneur de Lirey. In 1389, when it went on exhibition, it was denounced as false by the local bishop of Troyes, who declared it “cunningly painted, the truth being attested by the artist who painted it.” The Avignon antipope Clement VII (reigned 1378–94), although he refrained from expressing his opinion on the shroud’s authenticity, sanctioned its use as an object of devotion provided that it be exhibited as an “image or representation” of the true shroud. Subsequent popes from Julius II on, however, took its authenticity for granted. In 1453 Geoffroi de Charnay’s granddaughter Marguerite gave the shroud to the house of Savoy at Chambéry, and there it was damaged by fire and water in 1532. It was moved to the new Savoyard capital of Turin in 1578. Ever since, it has been publicly exhibited only rarely, as, in recent times, on the marriage of Prince Umberto (1931) and on the 400th anniversary of its arrival in Turin (1978). Scholarly analyses—attempting to use scientific methods to prove or disprove its authenticity—have been applied to the shroud since the late 19th century. It was early noticed (1898) that the sepia-tone images on the shroud seem to have the character of photographic negatives rather than positives. Beginning in the 1970s, tests were made to determine whether the images were the result of paints (or other pigments), scorches, or other agents; none of the tests proved conclusive. In 1988 the Vatican provided three laboratories in different countries with postage-stamp-sized pieces of the shroud’s linen cloth. Having subjected these samples to carbon-14 dating, all three laboratories concluded that the cloth of the shroud had been made sometime between 1260 and 1390. However, some scientists raised doubts about the researchers’ methodology. Upon receiving the results of the tests, the Vatican encouraged scientists to conduct further investigations of the shroud’s authenticity and recommended that Christians continue to venerate the shroud as an inspiring image of Christ. “Shroud of Turin.” Encyclopædia Britannica. 2010. Encyclopædia Britannica Online. 31 Mar. 2010 . Shroud Of Turin -New Research Dates Relic To 1st Century, Time Of Jesus Christ | The Muslim Times linked to this post. Pope Francis and the Turin Shroud” Making sense of a mystery | The Muslim Times linked to this post. more traffic to your website. It has the highest ROI (Return of Invesment) in all advertisement channels.